With her music, Tiffany Austin aims to speak to the times. 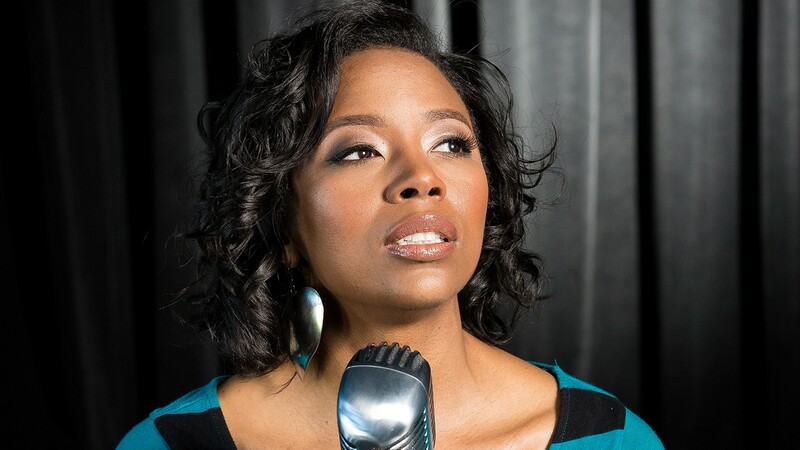 When Tiffany Austin effortlessly issues a stream of half-step vocal trills — a signature of enka, a Japanese folk style of music — the notes might transport you to 1950s, post-World War II Japan. At the same time, her deep, melodious tones and striking articulation summon images of Southern churches, juke joints, and jazz clubs. Her new album Unbroken, which came out this summer, expresses Asian influences and African-American ancestry through spirituals, bebop, blues, and swing. With nearly flawless, classically trained vocal technique and an affable personably, Austin creates a sense of place independent of actual location. Her second album also forcefully asserts her convictions as a woman, person of color, and artist privileged to "pass forward the flame of resistance," Austin said. It features her own original music and lyrics that reflect her Louisiana Creole heritage as well as arrangements of works by Ornette Coleman, Dizzy Gillespie, Charles Mingus, and John Coltrane. Backed by an exuberant band that includes trombonist Mitch Butler, who arranged seven of the 12 tracks, Unbroken rings true. "When I write, I think of Nina Simone," said Austin. "I think of her statement that it's an artist's responsibility to speak to the times. I touch down to what's inspiring me, but also what will speak to the hearts of other people — to endure, to thrive, and create beautiful things; to look back but also forward." As a musician, that also means constant, multidirectional growth. She studies Ghanaian polyrhythms and the conversational phrasing styles in Brazilian music with the goal of expanding her songwriting and vocal range. Marcus Shelby, a frequent collaborator, composer, bassist, and band leader, said Austin seamlessly integrates her roots with the classical idiom and the music of New Orleans. "She's able to do a lot of things outside of just jazz," he said, also noting her knack for writing arrangements. "As a performer, she's learned to emulate great singers even before she started to innovate." On the new record, "Ain't No Grave" builds on traditional gospel with harmonic language that Shelby noted invigorates the work's simple chord structure. Meanwhile, "Greenwood" documents one of the worst examples of racial violence in the country's history. Austin's lyrics tell of the 1921 incident in which an angry mob of white people — supported by local authorities — massacred an unknown number of primarily Black people in Tulsa, Okla. The song references "silent space" and "honor" held for 21st century parallels in Watts, Oakland, and Ferguson. Austin seeks healing by finding lost stories of human triumph amid tragedy. "A part of Unbroken is to voice the defiance to hatred that's boiling in our times. I want to recognize the heartache, but speak to the uplifting part of us," Austin said. "Black people are being murdered without impunity, from Emmett Till to Trayvon Martin and Sandra Bland, the list goes on and on. "This complete polarization, from the hope of a Black president to one who's affiliated with the KKK — the moment of love I hoped was welling up is not there. It's unrequited heartbreak," she continued. "I was speaking to America about hope. Hope to hoist us out of that heartbreak is imperative." To achieve perspective on highly emotional topics, Austin applies clear-eyed observation and the analytical, organized mind of a legal professional. After majoring in creative writing while studying classical voice at Cal State Northridge, she spent five years performing R&B in Tokyo. A scholarship offered by UC Berkeley's School of Law drew her back to California. After completing law school and working for a year, Austin began accepting invitations to return to music. Her first album, Nothing But Soul, "let everyone locally and in the country know who she is, her professional acumen, her emotional range," said Shelby. In describing her work, Austin uses a quartet of terms interchangeably: soul, church, communion, and connection. "It's reaching down in; reaching across to brother, sister, spirit. Law school next to music showed me where I make deepest connection," she said. Law school also taught her to prioritize. "If you read everything they tell you to, you'd die because you'd never eat or sleep," she said. "I tried that my first year. I learned efficient processes — not cutting corners but thinking like a hacker." As a professional musician, that means determining which social media platforms add value and how much direct interaction to have with venues, collaborators, and audiences. "There has to be time for the 10 hats I wear," she said, not to mention time for practicing the growls, slurs, breath control, and other vocal approaches that distinguish her sound.